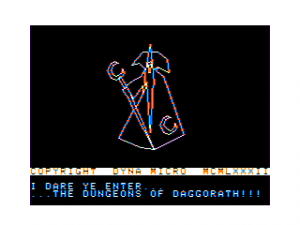 DynaMicro's Dungeons of Daggorath, released in 1982 for the Tandy CoCo, is one of the earliest examples of a first-person computer role-playing game. I recently had the chance to play this innovative title a few weeks ago as part of my research on the Tandy CoCo, and I must say that I'm impressed with the title--and can easily see why the game has managed to retain such a devoted cult following that's lasted nearly a quarter of a century. So, what makes the game so great? What I want to talk about here are three features--the immensity of the game world, the intensity of the action, and the creative use of sound. Although Tandy's CoCo arguably suffered from a rather dismal game library, DoD really stands out as a true classic. Essentially, DoD is a game in the tradition of first-person "D&D" games in the vein of Richard Garriot's Akalabeth (1980, Apple II) and Sir-Tech's Proving Grounds of the Mad Overlord (1981, Apple II). All three of these games focus on exploring 3-D wire-frame dungeons, killing monsters, and picking up various goodies along the way. The basic story behind DoD is of the usual ilk; an evil wizard has built his home deep in a monster-infested dungeon. A terrible curse has come upon the village, and the only way to lift it is for some foolhardy warrior to saunter down there and liquidate him. At any rate, the game features 5 levels and a vast area to explore. There are about half a dozen different creature types, four different magical rings, shields, swords, scrolls, and torches. You'll definitely need the last item, since it's a bit difficult to navigate a dungeon in pitch black darkness. Gameplay consists mostly of wandering about the dungeons and killing monsters to build up enough experience to descend to the lower levels (where increasingly difficult enemies await). Players type in short, abbreviated commands like "M" for move, "T L" for turn left, and "A R" for attack right. Items are either stowed in the avatar's backpack or held in either hand. It's a fairly intuitive system that is easy to learn, though a few of the lesser-used commands make it necessary to have the codes listed out on an index card for quick reference. How much can you cram into 8 Kilobytes? One of the most amazing and oft-touted feats that DynaMicro pulled off with DoD is the robust size of the game world. These were the days when efficiency trumped all other qualities because memory was at a premium. Since DoD was released on a "ROMpak" cartridge, it was limited to a scant 8 K (compare this to the 112 K available on a floppy disk for the Apple's "Disk II"). Of course, nowadays your microwave probably has more than either of these. Nevertheless, Douglas J. Morgan and Keith S. Kiyohara didn't let that stop them, and anyone who plays DoD today will no doubt marvel that so vast a virtual world could fit into such a tiny space! Of course, it wouldn't matter how big the gameworld was if the game itself was boring to play. Thankfully, DynaMicro found several ways to make their game intense. Most of these are due to Phil Landmeier's contributions to the game's innovative sound effects. Dungeons of Daggorath: Note the heart icon in the info bar.The most obvious of these techniques is simulating the avatar's heartbeat. A small heart pulses away on the bottom of the screen, accompanied by an appropriate "pulse" sound effect. The heart starts beating faster if the player enters commands too rapidly or if the avatar takes damage from monsters. The heart feature adds tremendous realism and intensity to the game, making it feel more like an action-game more in line with Doom than Ultima. I like this system much better than the old "hit point" numerical convention. It feels more natural than a fraction! The monsters also make appropriately creepy sounds, which serve as a vital clue as to their proximity to the avatar. It's quite harrowing to be wandering down a corridor, hear a sound, and not be sure exactly where it's coming from. You'll end up doing a lot of quick turning around to make sure nothing is creeping up behind you. In short, while the graphics are certainly impressive for the time (and especially for the platform), it's the innovative use of sound and the "heart rate" element that really bump this game up to classic status. As I mentioned at the start of this review, the DoD fan community is still going strong. There's even an official discussion board and Wiki for the game. Folks who don't want to muck about with a CoCo emulator can download an enhanced PC Port, and there has even been an effort to get the game working in a Web Browser (Note: I wasn't able to get the browser version to work). While it's arguable that a game like this has more historical appeal than actual replay value, I personally found it quite enjoyable and plan to continue playing and learning more about the game. I'd certainly encourage anyone else interested in classic games to check this one out. While CoCo emulation isn't as sophisticated as the Commodore 64's, there are plenty of pages and an active community to help you get started. Programmers and coders may also be interested in the source code should email Louis Jordan. Before doing so, check out the License Grant offered by Doug Morgan, former president of Dyna Micro. Apparently he's willing to give the code to anyone willing to cover the costs of shipping and copying (at Kinko's) the listing. Great look at an interesting game, Matt! I know it's was one of the CoCo games I made sure I had in my collection. I find it particularly interesting that the PC-port project had full access to the original source code. That's a great way to do a port and almost always ends in a great end product. Yes, the source code IS available, albeit you won't find it available online. The process to acquire the code is explained here. My guess is that no one is willing to pay the price of actually transcribing the code and making it freely available online, and that's a shame! Perhaps we ought to contact him and see what's up with that. This game EXCELLENT. Played it all the way to the end in the 80s and even though the graphics are simple to today's standards, the gameplay in it's day was revolutionary. Still a fun play today. STRONGLY recommend playing it. Even the port is pretty darn good. I addicted to this game back in the day, great game, ahead of it's time in it's time. Haunted by DoD for decades! I got this game in 84 when I was seven, but only started seriously playing it at twelve. I shudder to think of the hours, nay, weeks of my life I spent tramping through the dungeon. Many hundreds of hours. For the longest time I could only get past the Fake Wizard but would die promptly in the 4th level. Because I wasn't able to save, and it took hours to get to this point, I thought I was doomed to never beat the game. Only this past weekend, nearly 30 years after first playing it, did I finally accomplish this. I count it as one of my life's greatest acheivements. This game gets in your heart and soul after you've invested time into it. Matt is right: eventually you believe that heartbeat is your own. I am truly thankful for the geniuses that made this game, my fellow Wizard hunters (we know who we are), and the mercy of God to let me beat it before I died..."yet another does not return..."
Ed, did you actually beat the game on a real Tandy CoCo? If so, I am very impressed. Nevertheless, congratulations in any case! No, it was on an emulator. I wore out my CoCo2, which caused me to put the game down for several years. I broke the 'L' key, which prevented me from hitting 'A-L', which I find much easier than 'A-R'. Now that I think about it, I wouldn't be able to 'Look' either! It was only after discovering the mcspenser and iloveglory sites that allowed me to play again. I really am thankful I was able to pick up the game again and finish it. I really doubted I would ever see the final scene, which was troubling to me. At the same time, beating it is a little troubling too, in a strange way. A little piece of childhood is finally put to rest, I guess. You must be a player yourself? With my brothers, having 15 years play this great game in CoCo 2. Saving in tape and advance floor with better shield, torch and sword. Flask and Rings attack ghost and wizards. Excellent game in 8 kb. Coco start still today.